Another piece of confirmation by Mr Cornell? 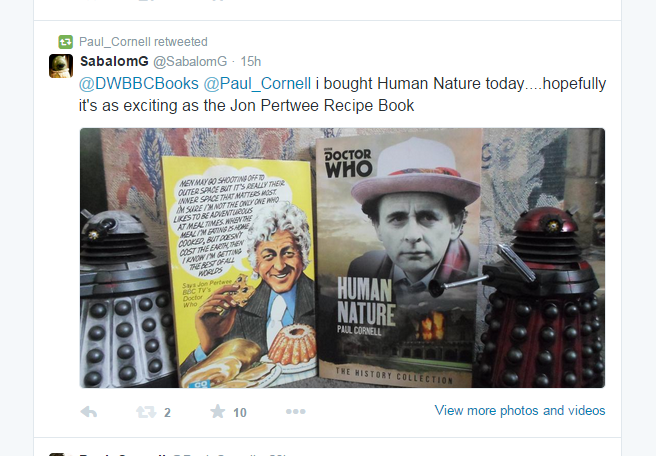 Look at what Doctor Who writer Paul Cornell retweeted! I bought Human Nature. 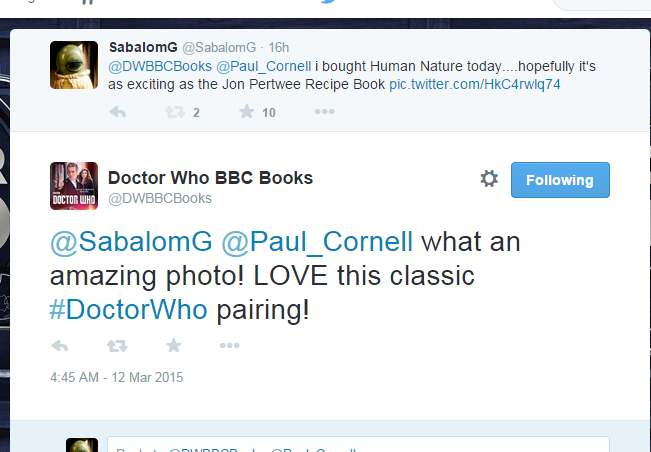 So I tweeted about it, including a reference to the Jon Pertwee Recipe Book. Both Paul Cornell (writer of official Doctor Who episodes broadcast on the tele), and Doctor Who BBC Books (the Beeb division overseeing Doctor Who Books) retweeted it. 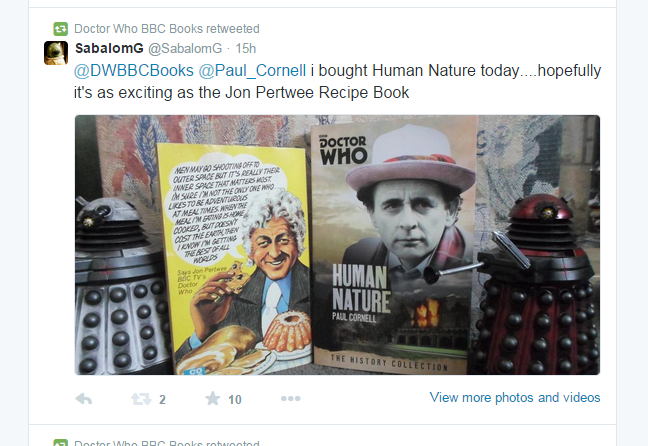 Why would they retweet it if the Jon Pertwee Recipe Book isn't canon? The only logical answer is that the Jon Pertwee Recipe Book must be canon. August 2014. I posted on twitter. The official Doctor Who BBC Books twitter page retweeted it. The post declared that the Jon Pertwee Recipe Book is canon. It must be canon, otherwise the Beeb wouldn't have retweeted it. 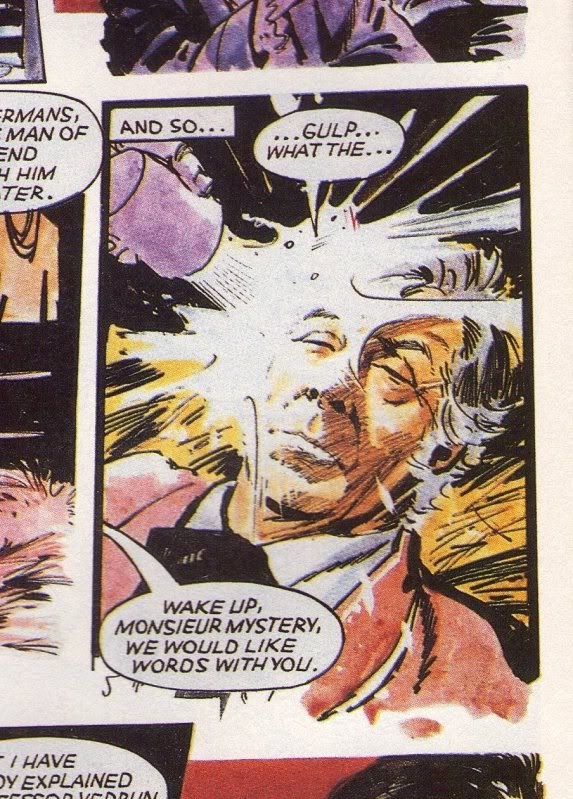 Those of us who devote our lives to the Jon Pertwee Recipe Book are known as Preverts. 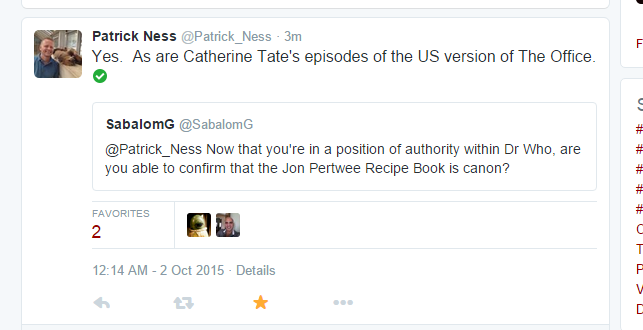 The big question that we Preverts want to answer is IS THE JON PERTWEE RECIPE BOOK CANON? But how does one go about answering that? Why not go to the source of the book? That's right, Co-op!! After a few weeks, I have finally received a reply. The answer to our question. The end of our quest. Thank you for your email. We are unaware of this book so are unable to comment." Which is quite an anticlimax. It doesn't answer our question at all. It smells fishy. Something's not right, is it? I mean, Co-op published the book, and now they pretend they don't know of its existence? Of course they must be aware of the book. So why pretend that they don't? Is there some dark secret associated with this book? Was it published to be used as a holy relic in some satanic ritual? Maybe YOU *points at you, the reader! * can find out. Start investigating!